He announced his retirement from all forms of the game on Sunday. Most of the cricketers prefer doing donning the commentator’s hat after retiring from the game. 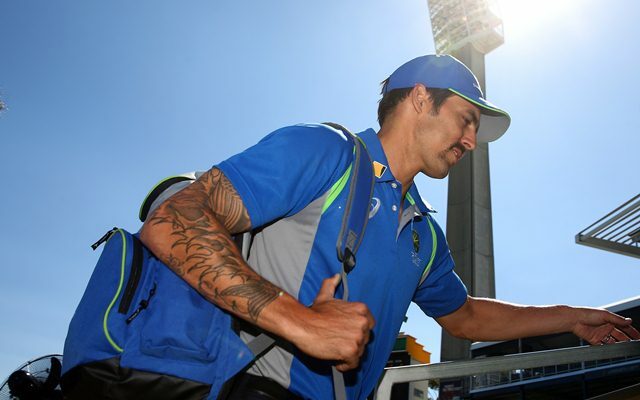 Former Australian cricketer and the fast bowler Mitchell Johnson announced his retirement from all the forms of cricket on Sunday and is now set to take the mic in hand to commentate in the ongoing edition of Karnataka Premier League (KPL). Johnson had hung his boots from the highest level back in 2015 itself and was only featuring in the T20 leagues across the world. He played for Perth Scorchers in the Big Bash League and earlier this year was picked up by Kolkata Knight Riders (KKR) in the Indian Premier League (IPL). He went on to play 6 matches for them this season and picked up only 2 wickets. Star Sports, the official broadcaster of the KPL, revealed the news on its official Twitter handle as they posted a video of Johnson without revealing his name and face. They urged the followers to guess the name and with the description given, it is clear that the former Australian is set to commentate in the T20 league soon. The 36-year-old had earlier hoped to play until the mid-2019 but his body seems to have stopped cooperating him now. He also went on to say that he had a bad back problem which led to him sitting out of the few games in the IPL as well. “It is over. I’ve bowled my final ball. Taken my final wicket. Today I announce my retirement from all forms of cricket. I had hoped to continue playing in various Twenty20 competitions around the world until perhaps the middle of next year. But the fact is my body is starting to shut down. During this year’s Indian Premier League tournament I had a few back problems and that was probably a sign that it was time to move on,” he was quoted as saying by Perth Now.